VIMS professor Walker Smith (L) and Mike Dinniman of ODU prepare to deploy the SG503 glider into the open waters of the Ross Sea. In the background is Mt. Erebus (an active volcano). Photo courtesy of Walker Smith. The SG503 Ice Dragon lifts its antenna-bearing tail into the air to transmit data back to researchers. Photo by Walker Smith. Glider Mike Dinniman of ODU with the SG503 Ice Dragon shortly before deployment into the icy waters of the Ross Sea. Photo by Walker Smith. Salinity data from the Ross Sea as sampled by the SG503 glider between November 29, 2010 and January 17, 2011. The x and y axes are latitude and longitude. The z axis (vertical) is water depth in meters. Graph courtesy of UW Applied Physics Laboratory. Researcher Walker Smith of the Virginia Institute of Marine Science has been conducting shipboard studies of biological productivity in Antarctica’s Ross Sea for the last three decades. This year he’s letting underwater robots do some of the work. 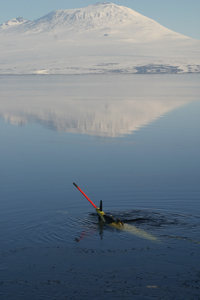 Smith and graduate student Xiao Liu are using a two-year grant from the National Science Foundation to deploy and test a free-swimming underwater glider in the frigid waters of the Ross Sea near the U.S. McMurdo Research Station. The grant also funds efforts by fellow VIMS professor Marjorie Friedrichs to use glider data to help improve computer models of the Ross Sea’s physics and biology. Smith deployed the team’s glider—SG503, also know as the Ice Dragon—for its first mission on November 29, 2010. He and colleagues, including investigators from Old Dominion University, launched the 114-pound vehicle through a whale breathing-hole, and then directed it into the open waters of the “polynya” that forms each austral summer when seasonal sea-ice melts from the Ross Sea. The launch, at a latitude of 77°S, is the most southerly glider deployment ever. A short (and unintentional) jog off course also made it the first-ever glider to successfully dive beneath the Ross Ice Shelf. The glider has now—as of January 19, 2011—completed 783 dives to depths as great as 700 meters (2,330 feet), traveling a total of 1,402 kilometers (871 miles). It is scheduled to continue yo-yoing back and forth across the Ross Sea polynya until the researchers retrieve it in early February. Each of the glider’s dives lasts about 120 minutes, during which sensors on its fiberglass hull measure water temperature, salinity, levels of dissolved oxygen, and chlorophyll concentrations (the latter a measure of photosynthesis and phytoplankton abundance). At the end of each dive, the glider flips its tail into the air so that its antenna can send the collected data to researchers and receive guidance for its next dive. Data is transmitted via the Iridium satellite network. Lacking a motor or propeller, gliders zigzag up and down through the water using a set of fins to translate changes in buoyancy into lateral motion. Their top speed is about one-half mile per hour. A small battery powers the buoyancy changes by forcing mineral oil in and out of an inflatable bladder. Moving the battery fore or aft within the hull shifts the center of gravity to control pitch, rotating it from side to side controls roll. Smith says that gliders bring several potential benefits to ocean research. For one, because they’re propelled by buoyancy changes rather than an energy-hungry motor, they can remain in the water for months at a time before needing a recharge (the current world record is a 4,500-mile transatlantic crossing that lasted 221 days, using the equivalent power of just 3 Christmas tree lights). Motor-driven underwater robots are limited to missions of a few days at most. A glider’s small size and simplicity (with only a few moving parts) also makes it relatively inexpensive to own and operate, especially compared to the costs of ship-based ocean research. Smith’s glider—developed at the Applied Physics Laboratory at the University of Washington and now sold commercially by iRobot, Inc. (maker of the Roomba© vacuum cleaning robot)—cost $150,000. A single ship-day, including costs for fuel and crew, can run up to $60,000. “Traditional ship-based studies can only provide snapshots of the constantly changing ocean ecosystem,” says Patterson. He says “that’s like trying to figure out what’s going on in a TV series like ‘Lost’ by watching just one or two episodes per year.” By sampling the ocean almost continually for months at a time, gliders allow researchers to better understand and model short-term physical changes and how they influence ocean biology. Previous studies by Smith and other polar researchers suggest that short-term physical variations—changes in sunlight, wind speed and direction, and current patterns—play a key role in controlling the magnitude, timing, and duration of phytoplankton blooms in the Ross Sea. These blooms sustain the Antarctic food web, from krill up to fish, seabirds, and marine mammals. But a comprehensive understanding of how these short-term changes impact the polar ecosystem has so far remained elusive. That’s where gliders come in. During the team’s upcoming retrieval mission, which sets sail on January 19, Smith and Liu will first spend several weeks comparing their shipboard measurements of water temperature, salinity, dissolved oxygen, and chlorophyll to those recorded by the glider. That’s to ensure that the glider’s sensors are still accurately calibrated after more than two months in the water. The retrieval team will be aboard the research vessel Nathaniel B. Palmer. Friedrichs will feed the glider’s high-resolution data into computer models of physical and biological processes in the Ross Sea, with the long-term goal of making model predictions more accurate.